Marsha: So Steve, we're going to talk about one of your favorite topics today, and that's cash flow and how we help improve cash flow. So tell us, what's the secret? 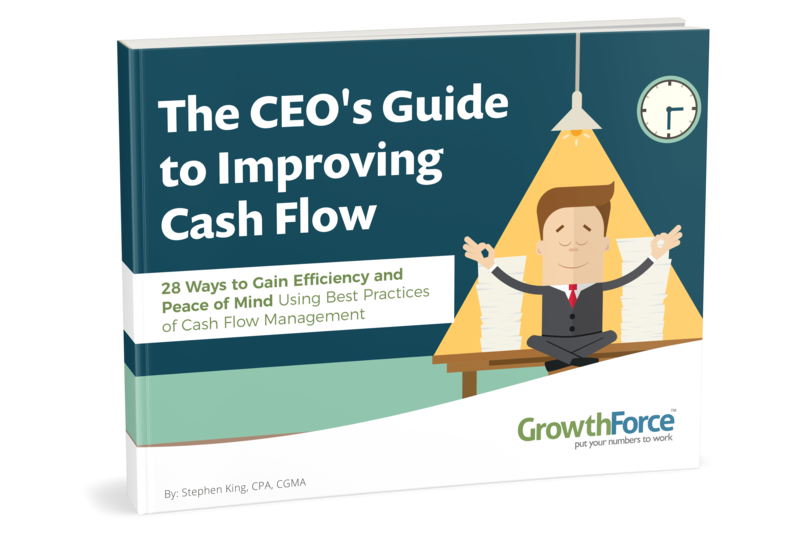 Steven: Well, 80 percent of businesses, they say, fail in the first years because of 3 reasons: number one is cash flow, number two is cash flow, and number three is cash flow! So we're gonna help solve that. The way you avoid that problem is not let it be a problem in the first place, and I think there's three steps to do that. Number 1: define your client's payment process as soon as you get the signed contract. So we have chief outsiders as one of our clients, they're a case study, and as soon as we get a contract we call their client as the accounting department and say, "Hey, we've got a new contract with you. Who do we send the bill to, who's going to approve it and what's the payment process?" We want to know the day they pay the bills so that we can get ours in the list. The second thing we want to do is we want to be ready when we're doing collections process. You're always going to be firm, friendly and focused, but when clients are saying, "We're not gonna pay you," you need to have an answer for every single one of their reasons. If they're dissatisified you need to make sure that you know how to get their problem solved. If they have a short-term cash flow problem, offer them alternatives. But every single week you need to run that aged accounts receivable report with the largest amount first, take action, and anticipate the responses so you can be ready to solve it. And finally, manage your debt. If you've got credit card debt, often you get these low rates up front, and they baloon after the initial payment. So you want to make sure that if you've got a 20 percent interest rate from a credit card, that you're replacing that with a line of credit from your bank. Right now rates are really really low. And that's the best way to help you not be one of the 80 percent of the companies that don't make it to 5 years. Learn more about small business bookkeeping and solving cash flow problems with Growthforce guides and resources.